The UV330 features a sliding USB connector, which smoothly extends from the drive at the push of a thumb. The capless design eliminates the hassle of lost drive caps. 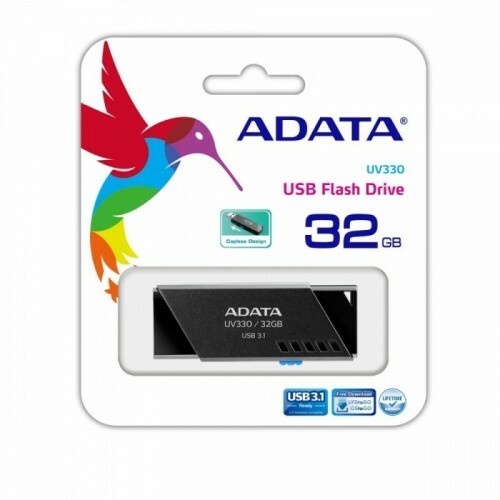 It comes with a high speed USB 3.1 interface and provides diverse capacities ranging from 16GB to 128GB, enabling you to share faster and store more. Available in two colors, black and red, to help you express your personal style. Thanks to USB 3.1, the UV330 delivers data in up to 5Gbps for convenience and efficiency from one super-compact device via simple plug n play. It's also backward compatible with USB 2.0. For added safety and personalization, the UV330 includes a strap mount for attaching to your lanyard or keychain of choice. Listing the devices you can use the UV330 would take forever. PCs, tablets, smart TVs, in-car systems, game consoles, home entertainment systems, and many more.